This weekend How to Train Your Dragon: The Hidden World took flight at the US box office, opening with a series-best $55.5 million. Hidden World is the third Dragon film from DreamWorks and their first in partnership with Universal rather than Fox, which had handled distribution for the previous two. Dragon 3 stars regulars Jay Baruchel, America Ferreira, Craig Ferguson, and Cate Blanchett. In this edition, Baruchel’s and Ferreira’s characters are riding their dragons when they find themselves in an underground Eden on a remote island. While exploring, their dragons are stolen by their nemesis and he plots to destroy their village. The film earned $34.7 million overseas this frame, with highlights coming from an $11 million launch in Russia and one worth $2.8 million in Spain. Combined global sales for The Hidden World are now at $274.9 million. As well as Dragon did at home, like last weekend, the US's biggest take was eclipsed by showings in China. Fox's Alita: Battle Angel launched there to a stunning $62.3 million, the studio's biggest ever in the Middle Kingdom. Showings in 81 other territories bought Battle Angel's overseas total to $92.4 million. 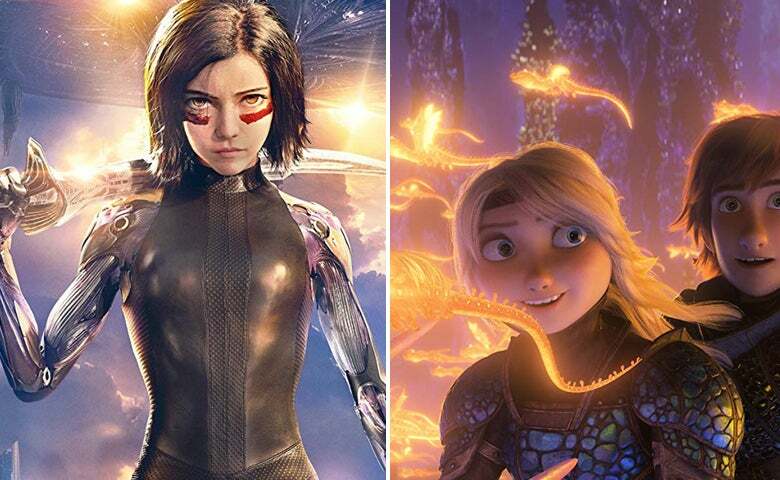 It slid down to second in the US with the arrival of How to Train Your Dragon, a heavy 58% drop leaving Alita with just $12 million in its second frame. Global sales reached $263.5 million after this frame, taking away some nerves, but not all in light of its reported $170 million net budget before promotional costs. Still, in China local hit The Wandering Earth added $36.7 million this frame, the third biggest single market showing worldwide. Its cumulative gross is now $684.3 million, the second biggest of all time for a local picture in China and inching closer to Wolf Warrior 2's $ 870 million record. US sales for the film have reached a strong $4.6 million and Netflix announced last Thursday that it has secured streaming rights for Wandering Earth in 190 markets, including the US. The rest of the North American chart was dominated by a series of holdovers with only one new entry, Roadside Attractions' Run the Race cracking the top rungs with $2.7 million in tenth place. After Alita and The Hidden World, The Lego Movie 2: The Second Part took third with $10.1 million. It has made $83 million at the close of its third frame, well behind the first Lego Movie's $257 million domestic gross. Lego 2 made another $10.3 million overseas, bringing its worldwide cume to $136.6 million, again a shadow of the first film's $469 million global take. Fourth place went to MGM's Fighting with My Family with $8 million in its first session in wide release, while fifth went to Warner's Isn't It Romantic, now at $33.7 million domestic after this $7.5 million second frame. In fifth and sixth place, What Men Want and Happy Death Day 2U made $5.2 and $4.98 million respectively. A bit farther down, in eleventh place, Golden Globe and Oscar winner Green Book made $2 million and reached a $69.6 million gross. We're likely to see wide releases and re-releases of the top Academy Awards winners next week, along with A Madea Family Funeral, as studios steer clear of Captain Marvel's launch on March 8.